I was there the night of August 15th, when the alleged "invasion" by the Kingdom of Hawaii and Majesty Akahi Nui purportedly occurred, wherein I witnessed the whole event first-hand; of the Kingdom entering and possessing the grounds, repossessing the Palace and reenacting the throne at the Iolani Palace by the Sovereign King of Hawaii. Now we shall set the record straight, to clear the gossip and unsubstantiated accusations. The Kingdom of Hawaii did not "protest or demonstrate with violent overtones", as some have strongly suggested. It was the State of Hawaii agents and officers who forcibly removed His Majesty from his own land, as well as Her Highness Akahi Wahine, their Cabinet and Palace Guard. The Kingdom of Hawaii did not "burglarize, break and enter, assault or criminally trespass" onto the Iolani Palace and grounds. It was the State of Hawaii who did this, forcibly removing the rightful owner of the property from his land. There was no illicit or larcenous intent to their entry. Majesty Akahi Nui and the Kingdom of Hawaii did not "storm the Palace". The Kingdom of Hawaii followed all procedure, administrative remedy, proper registry of claims, deeds, and notices to the appropriate parties in the matter of the Palace occupation, fulfilling all lawful obligation of public notice, offering ample time for any rebuttal, counter claim or objection to his claim of his family's land, buildings and possessions. All parties stood moot, agreeing with everything the Kingdom did through tacit procurement since the year 2000. BOC #2000-176035 (evidence of proof). The Hawaii Kingdom (monarchy), and its Kingdom of Hawaii (government), under His Majesty Akahi Nui are the original governing structure of Hawaii returning to power. It has never been, and never shall be, a "sovereign group". This is not the first act as King Majesty Akahi Nui has concluded. When we facilitated his Crowning and Coronation on February 23rd, 1998, at the Palace Coronation Gazebo, by the ancient laws of monarchical succession, Majesty Akahi Nui had reseated his family's throne. Without valid challenge or counter-claim against his rite to the Crown of Hawaii, Majesty's existing position as King remains steadfast and in force. Any valid challenge to his claim would have occurred long ago. This recent event was not a "re-seating", it was a "reenacting the powers of state". Considering the Akahi Family Royal Patent Deed for the Iolani Palace, combined with his 100% royal blue blood, he has no choice but to resume his capacity as King. In fulfilling all [international] obligations of state, Majesty Akahi Nui knew his reentry and possession of his family's palace was going to create quite a stir. So he required extra protection and enforcement regarding these matters, in order to preserve the welfare of all those involved, on both sides of the issue. His response to Majesty Akahi's request for protection and assistance regarding the repossession and reenacting of his throne, involved the issuing of three warrants; The First Warrant is a NOTICE OF PASSAGE, which encompasses prevention of unauthorized trespass, in respect of the land being Kingdom soil. 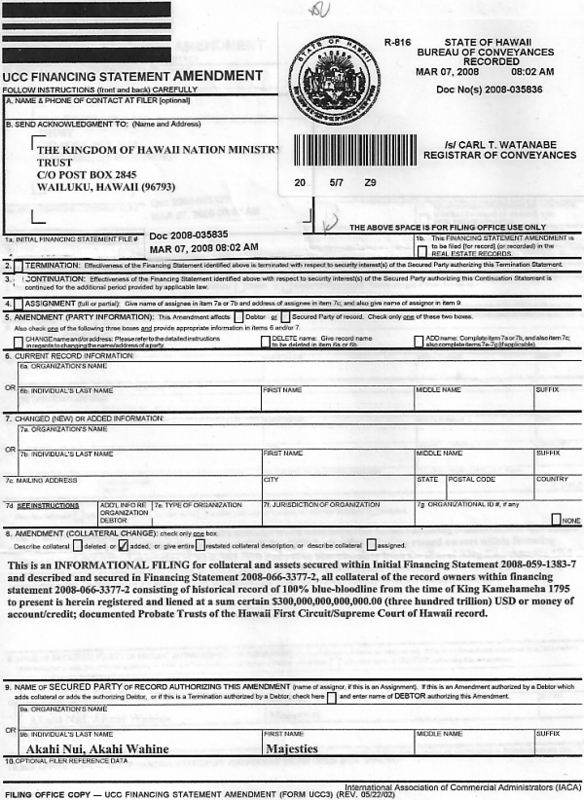 The Second Warrant is a FEDERAL PROTECTIVE CUSTODY ORDER to protect His Majesty, Her Highness, their Cabinet, Royal Guard and all aspects of the Kingdom of Hawaii from endangerment, and the Third Warrant is a FEDERAL ARREST WARRANT to prevent the State of Hawaii and its agents (or anyone else) from causing harm or endangerment of endearment to the Kingdom and everyone involved. 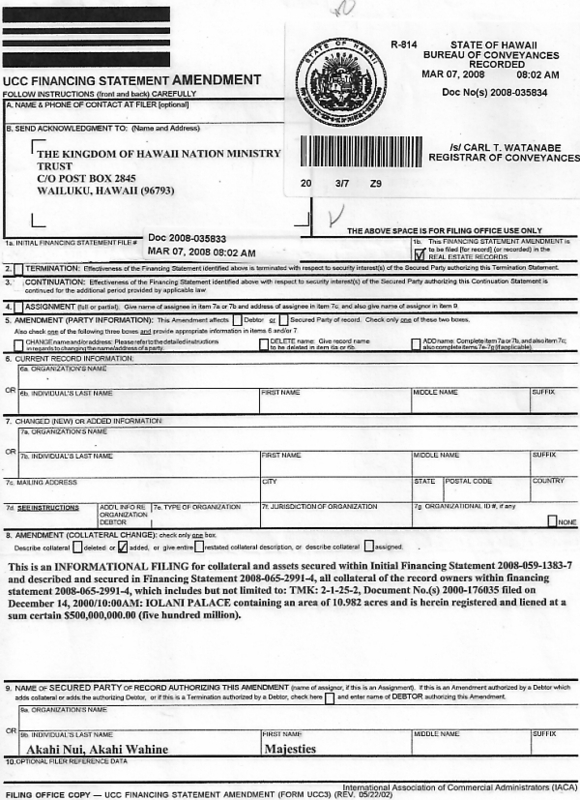 All of the warrants were issued under the authority of the U.S. Provost, the highest enforcement on the land, requiring U.S. Congress (to whom Marshal Love reports) to investigate. Since these warrants and the PROPERTY OF THE KINGDOM OF HAWAII TRUST were conspicuously posted on each gate and entrance (clearly delineating the boundary where State of Hawaii jurisdiction ends and federal jurisdiction begins), just by the State of Hawaii enforcement officers crossing the palace fence without proper authorization from the Marshal, caused them to violate federal law. By breeching a federal protective custody order, violating an arrest warrant and threatening a Sovereign upon his land, now violations of the U.S. constitutional law are in effect (Art. 1 Constitution U.S.A.: "Treaties are the supreme law of the land."). Marshal Love then proceeded to fulfill his other obligation of state by facilitating the reentry of the King into his Palace, and concurrent reenactment of the correct lineage onto the throne, with explicit orders there would be no violence, no bodily harm nor any damages to the palace or surrounding grounds, and no pilfering whatsoever. During this act, the State of Hawaii showed up in full force, with armed HPD policemen, storm troopers, DLNR attorney generals and enforcement officers, who then assaulted, kidnapped and forcibly evicted the King, Queen, their Cabinet and Royal Guard, and they even arrested "a federal Marshal" who was "on duty" off the grounds, incarcerating them unconstitutionally. Reinforcement of Marshal Love's position came from a unique combination of two capacities of state; he also was appointed by His Majesty to Royal Marshal of the Provost for the Kingdom of Hawaii Nation, to assume authority from both sides, to assure everyone's safety and prevent any property damage to the Palace building and grounds. During the incident, after everyone else was removed, it took State officers three huddles and numerous questions to the Marshal to decide what to do. Afterwards, Love stated the the HPD probably just wanted to take him aside so he could explain "just what was going down here", because they knew; you do not arrest federal Marshals. However, the Attorney Generals for the DLNR decided they would arrest the Marshal after receiving report he allegedly assaulted a state employee (which is turning out to be contrived). He also recalled hearing one of the officers say; "Uh oh, somebody really 'goofed' up, big time." Besides the fact the State of Hawaii obstructed a federal investigation, they also attempted to murder the federal Marshal during his incarceration, with what Marshal Love deduced was a mixture of mind-altering drugs and poison, of which he still feels the effects two weeks later. He immediately began experiencing dangerous side effects from the first glass of water, and survived the false imprisonment by drinking only tap water, losing 15 pounds in the three days of incarceration. With all necessary and proper documentation in front of them, from an international point of view, their rough-shod over-the-fence, imperialistic storm-trooper attitude violated not only the three U.S. federal warrants, they also criminally trespassed on foreign soil, violating diplomatic capacities of state by assaulting, kidnapping and endangering a Sovereign upon his land, in violation of the Vienna Convention on Diplomatic Relations (VCDR) 18th April 1961, to which the U.S. is a signatory. All this because they did not investigate the Kings' claims, which he had proof of in his hands, and demanded they review before they arrested them. Now they will learn the ramifications of entering the land of a foreign sovereign government in friendly treaty with the U.S. and violating five treaty agreements, as this becomes a matter for the International Criminal Court at the Hague to adjudicate. When they decided to "arrest a sovereign group for breaking and entering into a monument of historical significance", they effectively assaulted a Sovereign owner and his people, kidnapping them off his land by force. In property title law, a title holder must willingly give up their interest in a property. Since the Kingdom did not willingly leave, by right of international law, the law of nations, and many other systems of law, His Majesty still seats and holds the throne, for the one who originally requested justice from Congress in 1893, Queen Liliuokalani, and for himself by rite of succession. Realize that it was not the "seating of the throne", it was the "reenacting the powers of state" they interfered with the night of August 15th, 2008. Therefore, his presence on and of the throne is not in contest (that was done in 1998 with the Crowning and Coronation), the interference of state affairs of a Sovereign government by State of Hawaii through intervention of military force is under contest. The Kamehameha line came out of the Akahi line. If Majesty were born at the same time Kamehameha I was born, they would be brothers. In traditional Kingdom law, the one with the strongest blood is Sovereign by inherent rite. His Majesty has 100% Royal Blue Blood on both sides of his family. We've been looking for years, and have yet to find another. If there is another, they better have the pala pala (paper) to validate their claim of credentials. Look at His Majesty's Konohiki Council Seal of 1840 (the council of elders behind the throne in 1840). It says "Akahi" because that is where its power comes from. Majesty Akahi Nui, who is a direct descendant of Liloa, and of 100% royal lineage on both sides of his family, has the Iolani Palace on his personal family's land, included in the Akahi Family Royal Patent Deed, Granted by Kamehameha to Akahi during the King's Mahele, which preceded the Great Mahele in 1848. Why do you think his family's coat of arms and crest is all over the Palace? 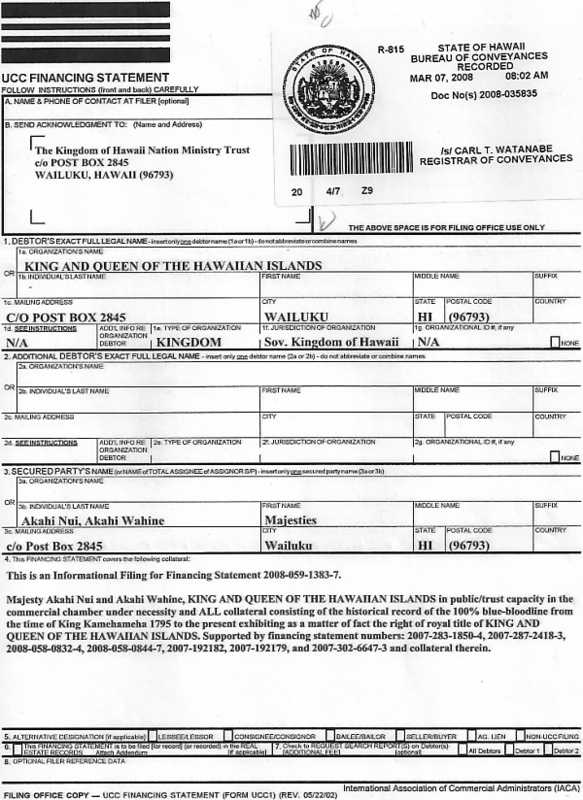 What kind of Kanaka Maoli "owns" a Palace deed? It isn't even possible for a normal subject to own a Palace. The State of Hawaii had agreed with Majesty's ownership of the Palace since the year 2000, when it was originally filed. By the (communist-styled) State of Hawaii's own laws and legal rulings, they are obligated to hand over Hawaii if a true heir comes forward, they must hand it over. Just because it is an incredible inconvenience and international embarrassment for the country who claims to be the policeman for the world, does not mean it cannot obey its own, as well as numerous international laws, in its obligations of state. Those who did the assaulting against the Majesty's and their Palace Guard are the ones who broke the door and lock of the Palace. They kidnapped the Sovereign and federal Marshal in the course of his duty. It was His Majesty who gave the orders for the Marshal to enter, and State of Hawaii Palace security refused to allow access. By eye witness accounts, so as not to harm the doors, the Kingdom was disassembling the locks on the left door to no avail, and the right door swung open on its own with no one touching it. The King, Queen, Legal counsel and Guard entered, and when Marshal Love turned around and saw HPD coming up, he was going to enter and lock the door, but someone shut it from inside, leaving him locked out. The police then entered by force, breaking open the doors on both sides of the Palace, and then marring the historical wood floor with combat boots that act like sand paper. Since 1992, Majesty Akahi Nui and his Kingdom have invited other groups many times to meet with us, in such venues as unity gatherings and private conferences, so we could compare our paperwork with theirs to see who has the strongest position, and discover how we can work together. None have accepted. We have given the County of Maui, State of Hawaii and other officials numerous offers to meet with us, to see how we can work this out, to no avail. Not once has anyone ever accepted our invitation to come together to straighten this thing out. How many more times should we offer to work together, so that some compromised agreement can be argued and never reached, only to be shunned while they continue to commit acts of genocide against the Kanaka Maoli people in the interests of self profit? That time is past, water under the bridge long out to sea. This is an open challenge to all to bring their proof forward, and we shall stand, pala pala to pala pala (paper to paper). We challenge anyone to prove His Majesty Akahi Nui and federal Marshal Love are not who they say they are. Come forward, and the truth of all evidence shall stand on its own merits, and we shall submit it into the Congressional Record. To those who allege that the Kingdom of Hawaii conducted "protests and demonstrations with violent overtones", we agree that is a wrong route to the goal. Rest assured the Kingdom did no such thing. However, those who attempt to accuse His Majesty and his Kingdom of such things better know what they're talking about and be able to substantiate their claims, for we are holding everyone accountable for their actions. Any attempt to demean us in order to validate their own position without proper consideration of all factual evidence will be named in the Congressional record as party to the facts for the federal Congressional investigation. When someone assumes conclusions without facts, creates false fabrications and talks behind others' backs to self-validate their position, it demonstrates the mark of cowardice in a diminished soul. Likewise, those "secret" agencies of government which pride themselves for having so much intelligence, yet sneak around like a thief in the night, scurrying about like cowards while attempting to manipulate world power for the benefit of their illicit masters, had better review their course of action. For only in the Honorable Light of Day shall we achieve what man tried secret in the night. No manner of hiding can conceal what God has Shone as their truth, for He knoweth all things. All shall meet Him, their Maker, and what will they say to He who knows every thought and deed, as He considers the fate of their Soul, which rests in His Hands? If you wish to speak with us, meet us face to face as do honorable men, so we may address your issues directly. Just know that from now on, all things will be done publicly, for all the world to see. As others say the King must take into account the opinions of non-Hawaiians, the fact remains the foreign presence which claims to have rights in fact have none, having proven their intent beyond any doubt to harm the welfare of his people and nation. That right for those foreign to the soil of Hawaii to a voice was forsaken long ago, when it forsook the very land and people who hosted them here, silencing the voice of the land and the people as they destroyed it. How can the Sovereign of Hawaii respect the opinions of non-Hawaiian residents, if they do not respect the indigenous culture and its government? Hawaii is a gift from God, and the Kingdom is a gift from the gift. Do you know what happens when you disrespect a gift? It is taken away, and never returned. The Kingdom is like a mirror; what you do to it, you do to yourself and God. In His Majesty's opinion; "My people suffer for lack of honor." It is therefore his obligation of office to neutralize and remove that threat. In the case of Hawaii, there is such a repressive "non-Hawaiian" influence which has pervaded even the minds of Hawaii's original population, there is lacking sufficient numbers which he can entrust these matters of returning the Kingdom. The price of sovereignty is being responsible for your thoughts and deeds, defending what is right, and taking a stand when its needed the most. Majesty Akahi Nui did what a true leader had to do, put his life on the line to get his Kingdom back, and make sure his people are safe. What price are you willing to pay to leave a rightful legacy for your future generations? That which drives him, being the Almighty Creator, same which animates his course, does not compromise. It is like us telling God what to do. Instead, it is necessary to search our own souls, and see which we follow, a truth or a lie, and if we remember the original Grant from our Creator to Mankind to care for His world. Where does the State of Hawaii conduct its business every day? On Majesty Akahi's personal family deed land. Where does the Governor sleep? In Queen Liliuokalani's House, His Majesty's great aunt. Who now has reclaimed all lands in Hawaii through the Royal Patent "Island" Deeds, effectively voiding all current, cloudy and fraudulent land title in January of 2002? Majesty Akahi Nui. Who has his family's Coat of Arms all over the Iolani Palace, so much you can't stand anywhere on the grounds without seeing at least one of them? Majesty Akahi Nui. The next time you look at any particular State of Hawaii corporate logo for different divisions of government, see if you can see any part of the Akahi Coat of Arms within it, in plagiarized copyright infringement. So how can he not be the King? As you think about all of this, just remember whose soil you're on, because it sure doesn't belong to the State of Hawaii. You may want to consider who will be replacing Hawaii as the 50th star.